Makes 24 (1 ice cream sandwich) servings. MIX flour, cream of tartar and baking soda in small bowl. Set aside. Beat 1½ cups of the sugar, butter and shortening in large bowl with electric mixer on medium speed until light and fluffy. Add eggs and vanilla; mix well. Gradually beat in flour mixture on low speed until well mixed. Refrigerate 1 hour. MIX remaining 1/4 cup sugar and cinnamon. Shape dough into 1-inch balls. Roll in cinnamon sugar mixture to coat. Place 2 inches apart on baking sheets. BAKE in preheated 400°F oven 9 to 11 minutes or until lightly browned. Cool on baking sheets 1 minute. Remove to wire racks; cool completely. Mix 1/2 cup each agave nectar and heavy cream, 1 tablespoon espresso granules and 2 teaspoons McCormick Gourmet Collection Roasted Saigon Cinnamon in medium microwaveable bowl. Microwave on HIGH 1½ minutes or until mixture just comes to boil. Add 8 ounces bittersweet baking chocolate, coarsely chopped; stir until chocolate is completely melted and mixture is smooth. Stir in 1 ounce coffee liqueur, if desired. Cool slightly before serving. Makes 1 1/2 cups. Mix 1/4 cup agave nectar and 2 teaspoons McCormick Gourmet Collection Roasted Saigon Cinnamon. Brush onto 12 medium to large strawberries. Grill over medium-high heat 1 to 2 minutes or until grill marks appear, turning occasionally. 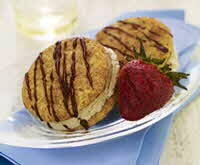 TO ASSEMBLE ICE CREAM SANDWICHES, place about 2 tablespoons ice cream on the flat side of 1 cookie. Top with a second cookie, pressing gently. Repeat with remaining cookies and ice cream. Drizzle ice cream sandwiches with melted chocolate, if desired. Freeze 2 hours or until firm. Serve with Decadent Cinnamon-Chocolate Sauce and Grilled Strawberries, if desired. Wrap each frozen ice cream sandwich in plastic wrap or foil. Place in freezer- weight resealable plastic bag. Store in freezer up to 2 weeks.